Alpine Crawler World is an off-road 4×4 truck racing game for the iPhone by 3-D Magic. 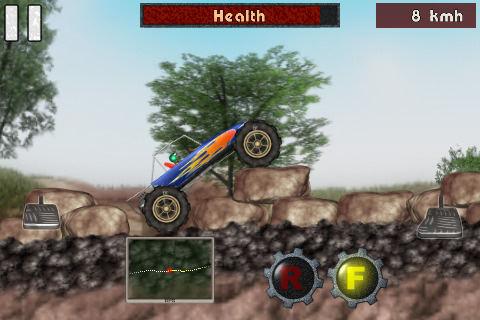 the game features realistic graphics for the trucks and backgrounds as well as weather effects, terrains and obstacles, and four different racer cars to choose from. you can play the game in 3 different modes (free ride, time trial, challenge). Tracks are laid out from left to right in feature random whether and time of day effects. For example you can play in night mode where the only thing you can see it whatever your truck’s headlights have illuminated. there are also rainy days and know we conditions. Each terrain has its own set of graphics and characteristics. Alps is the easiest one followed by Kentucky and then Sweden. It Alps the track is grass covered and fairly smooth. Kentucky introduces boulders and rocks on the track and Sweden get even more tricky as the entire track is covered in snow. Each location has a total of 10 tracks that can be unlocked. Tracks get more difficult as you move up. Although there are great physics for how the truck moves and interacts with obstacles in the road, the controls are not physics-based like in other racing games such as Moto X Mayhem. There are three cars in Alpine crawler world: Jeep AWD, Fire Crawler AWD, and Pick-up RWD. A fourth racer car is also available that must be unlocked first. Choose your character from five drivers (Jason, Bronson, Christine, George, Koto) to customize your playing. In free ride mode you can choose your car while in time trial mode you can only custom paint the car assigned to that location, but not change it. Game controls and AC World are done using a virtual gas and brake pedal which tap and drag down. the more you push on the gas, the faster your car goes, and you can even peel out in the dirt and snow. The transmission can be switched to go forward or in reverse using two R and F buttons, helpful for when you get stuck in the mud or need to back up again boost before you can climb a large hill. Your trucks have a limited amount of health that depletes as you crash into rocks or slam down too hard. To help you plan your moves there is also a GPS device that shows a simple dotted line of the upcoming trail map. when you play in the time-trial ride mode you also have to make it to the checkpoints before you run out of time. Tracks typically have 1 to 2 checkpoints indicated by orange flags. If you’re not careful you can flip your truck over, deplete your health and get knocked out, get stuck in a ditch, or just run out of time. The sound effects and animations in AC World are brilliantly fine-tuned to add an element of realism when playing the game. Things like break lights, squeaking shocks and driver groans as you land, engine idling and revving up noise, breaking, and sliding effects are all dynamically adjusted as you play the game. The game also has auto changing camera angles that zoom in when at lower speeds and zoom out as you speed up to give you a better view on the landscape. Overall, Alpine Crawler World is a completely unique 2-D off-road racing game to the iPhone and iPod touch worthy of high praise for its use of realistic graphics, sounds, and physics. there is enough content here to keep you busy for a long time. Without a doubt worth the price. AppSafari review of Alpine Crawler World was written by Joe Seifi on March 8th, 2010 and categorized under App Store, Featured, Fun, Games. Page viewed 4457 times, 2 so far today. Need help on using these apps? Please read the Help Page.